When you do a cake decorating course something peculiar happens, people around you start thinking of occasions for you to make a cake. On one such occasion my work mate asked me to make a cake for her husband. Sure, a cake for my work mates husband sounds easy right? Then she asked for a motorbike, then little models of her and her man! ARGH! I didn't think I could actually pull this off but because I love a challenge, I accepted. I started trying to make the motorbike a few days prior to the cake day. I practically tore out my hair trying to get it to look good. Then along came my hubby, my awesome, manly, knowledgeable on motorbikes hubby! He looked at the pictures of Norton bikes I had printed out and helped me. Of course he used all the fancy words like "Engine" and "Valve" I would just say back "What shape is that? A grey round thingie?" After finishing the motorbike (what a mission that was!) I got on to making the little people. I looked up on You Tube for a tutorial and tried following that. Back then I had never even heard of Gum Paste so these little models were actually made out of Fondant! At the time I thought they looked pretty good, the next day, however, they sunk a little and were kind of looking in two different directions! The Chocolate Cake was actually my work mates recipe! I iced it in chocolate buttercream then piped some words and decorations using light brown buttercream. 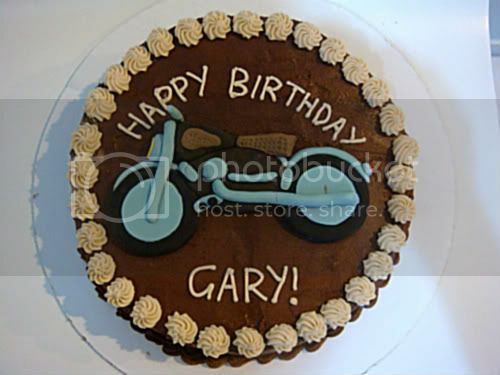 I sort of hope this is the last motorbike cake I will get asked to do...but there's a part of me that wants another challenge, so who knows?! 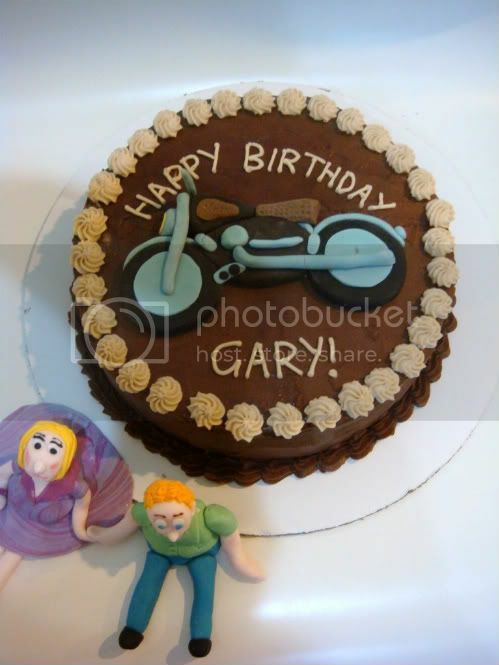 Maybe one day I'll get asked to make a Harley Davidson cake!